This is a thank you letter from NIU in response to a banner and photo that was sent from the VT Office of Research. A card with each victim&#39;s name and a flower. This letter was sent by a Florida inmate along with a handkerchief with hand-drawn doves and the victims&#39; names on it. This letter from the Vice President for Student Affairs, Zenobia Lawrence Hikes, hung at the entrance to the Perspective Gallery in Squires. 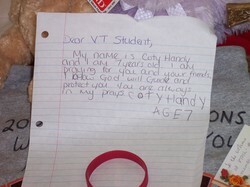 This letter was part of one of the 32 memorials. The tragedy affected people of all ages. Feeling that we truly are brothers and sisters to all of you, please know that our prayers are constantly with you as is our great sympathy.